The Red Sea becomes another world after sunset when it's completely dark underwater and only a torch light your way. 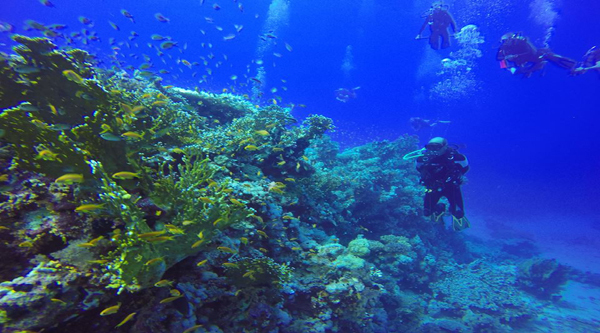 Do not miss out for these wonderful places Sharm el Sheikh has to offer to dive at night. 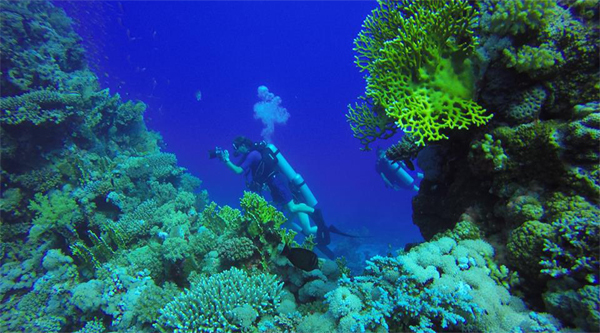 The place located on the southwest comer, is a convenient anchorage and a good place for a first night dive in the Red Sea. A short wall drops to a sand shelf at 25 feet, and then slopes to a sand plateau at 100 feet. It continues deeper in a series of steps, surrounded by the rock walls of a gradually narrowing canyon. In shallow water, coral outcrops house reef fish by day, with an occasional crocodile fish in the sand. At night, the typical mixture of nocturnal creatures is present. This is one of the few places to catch a glimpse of the rare Red Sea dugong (a close relative of the manatee) swimming in the sea grass. Look there for sea horses as well. Don't forget to cruise the sand for crocodile fish, blue-spotted stingrays, and nurse sharks. Turtles and large moray eels are also seen regularly, as are eagle rays and large schools of barracuda. It's a good night diving spot for advanced divers, but difficult when strong winds blow from the north. A big flat formation, is usually done as an afternoon dive because of its shallow area. A Cargo from a 1950s shipwreck is scattered about the reef. On the east side, the maximum depth is 65 feet at the edge of the drop-off, while the southern end slopes gently to only 30 feet some 50 yards from the reef. The east side offers better scenery. This is a good night dive when there is no wind. It can be reached only by boat. This is a sloping wall with a few coral outcrops where Anthias aggregate around coral formations and sea fans. Reef fish also concentrate around these formations, making this a good area for both close-up and wide-angle photography. Work the coral outcrops for fish close-ups. There are also some interesting caves between 10 and 20 feet. The safe, easy anchorage makes Far Garden an excellent spot for night diving. You are almost certain to see Spanish Dancers. 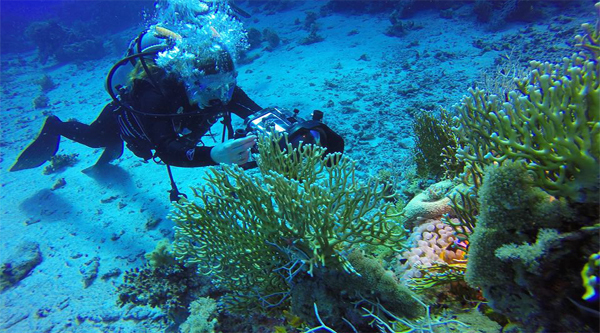 This is one of the best places to see striking coral formations. Entry is down a rocky trail, then 50 yards over the reef top. The sloping wall is interspersed with fantastic shapes of large pillars and towers. 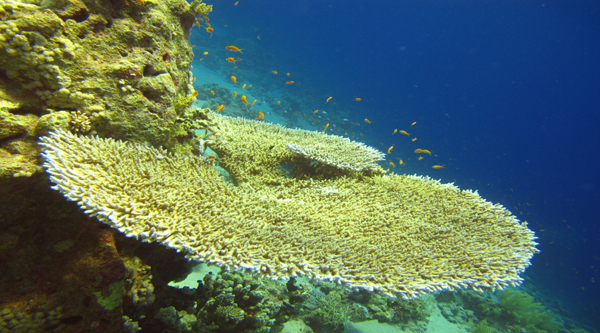 Many are topped by table corals, gorgonians and soft corals. There are all kinds of natural, arches and lattice work for dramatic silhouettes. Some house schools of silver sweepers. The largest formations seem like old, dead things with new growth on top of them. Most of the interesting ones lie at depths from 60 to 80 feel. The further south one goes, the more varied shapes are encountered. Soft corals lend a touch of colour, but aside from an occasional moray eel and curious Napoleon fish, small reef fish predominate. This is also an excellent spot for night diving. Naama bay because of the fine sand bottom, visibility here is usually limited to 40 feet and less. Shallow reefs at 15-20 feet offer close-ups of reef fish, especially many calm and docile lion fishes. Beyond the reefs, a sea grass bed gradually slopes into deep water. Lionfish, tinted green to match their surroundings, often hover over holes in the sand seeking prey. Cassiopea jellyfish are common here, and even sea horses have been reported. 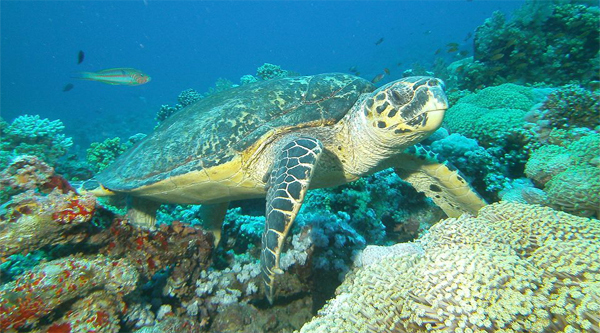 A large turtle, hosting several remoras, is a permanent resident and can often be found in the sea grass. This is an excellent site for twilight and night dives. In the evening it can be an ethereal dive, as the soft sand bottom makes it seem as though the reefs are rising out of the mist. It is also an excellent area for night dives, with flashlight fish, crabs and Spanish Dancers.